Micky Fredman was born in Minneapolis in 1920 and raised in Wisconsin. Before entering the Navy in World War II, he earned a bachelor's degree in economics at the University of Wisconsin. During World War II he served as an anti-submarine warfare officer in the Pacific and Atlantic and was recalled to active duty during the Korean War. Between wars, he married Faiya Rubenstein. After settling in San Diego, he studied law at night while selling insurance during the day. 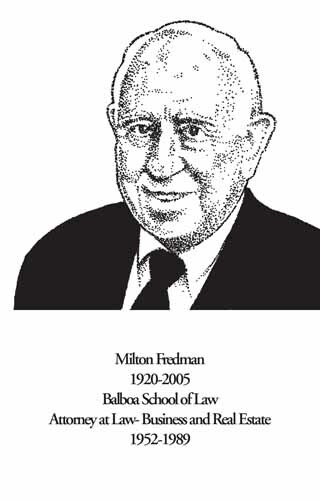 Micky graduated from the Balboa School of Law and began his thirty-seven-year practice in 1952. Specializing in business and real estate law, he served as a court-appointed supervisor of property sales and claim settlements in bankruptcy cases involving large corporations. In 1966-67, Micky took a sabbatical from his law practice to represent the United States at Expo 67 in Montreal as deputy commissioner general for the U.S. pavilion. He went on to serve from 1969 to 1972 on the San Diego Port Commission and served on CCDC. Micky became president of Fronteras, a border business organization, and chairman of the county International Trade Commission. In 1973 he was a founder of San Pasqual Winery. Micky was the first chairman of the San Diego Commission for Arts and Culture in 1988 and helped plan the Russian Arts Festival of 1989. A longtime supporter of the University of California, San Diego, he raised funds for the endowment of chairs in the names of Paul Saltman, Murray Goodman, and Marshall Orloff. In his final years, he was a strong advocate for and a board member of the La Jolla Playhouse.